Fabrication process and morphology characterization of wrinkled graphene-based multilayer films. Textured surfaces with periodic topographical features and long-range order are highly attractive for directing cell-material interactions. They mimic physiological environments more accurately than planar surfaces and can fundamentally alter cell alignment, shape, gene expression, as well as multicellular organization into hierarchical tissue architectures. Here we demonstrate for the first time that wrinkled graphene-based surfaces are suitable as textured cell attachment substrates, and that engineered wrinkling can dramatically alter cell alignment and morphology. 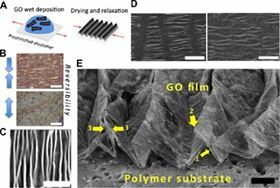 The wrinkled surfaces are fabricated by graphene oxide wet deposition onto pre-stretched elastomers followed by relaxation and mild thermal treatment to stabilize the films in cell culture medium. Multilayer graphene oxide films form periodic, delaminated buckle textures whose wavelengths and amplitudes can be systematically tuned by variation in the wet deposition process. Human and murine fibroblasts attach to these textured films and remain viable, while developing pronounced alignment and elongation relative to those on planar graphene controls. Compared to lithographic patterning of nanogratings, this method has advantages in the simplicity and scalability of fabrication, as well as the opportunity to couple the use of topographic cues with the unique conductive, adsorptive, or barrier properties of graphene materials for functional biomedical devices. This paper was originally published in Carbon 97 (2014), Pages 14–24.